Setting up a website is fairly simple. We do ​much more. We create strategic experiences with the aim of engaging your audience while building your brand’s credibility. Are you ready to launch your business to the next level using the great reach of the internet? ​​We can help. Whether it is a brochure site connected to your social media, an online ecommerce platform or fully integrated database driven online application. We'll build a solution which best promotes your brand and grows your business. A great website should increase your revenue and lower your workload. Does yours? You want the best chance of being found by search engines, while promoting your brand. Put your products in front of your buyers. You need an ecommerce website that is easy to navigate and allows your users to purchase products quickly. Advanced, interactive online systems where users can login and store information. Web apps allow business processes to be streamlined into a dedicated and easy-to-use online interface. Unlike most web people, who expect you to tell them what to do, we spend time to work out what you really need. More than just web design and development, we’ll get a true picture of your business by uncovering the real problems you’re struggling with. Not just the ones you think you have, but also the ones you may not know you have. We’ll work with you and your team to build a smooth online system that will grow your business and simplify how it runs. We solve both your visible problems and ​the hidden ones and we’ll do it effectively and efficiently. ​h2o will bring the joy back to what you do - your business! Web development that helps you get found on Google and is easy to navigate on a mobile device.  Having a mobile friendly website means your website will rank higher when potential clients are searching for your product or service from a mobile device. ​Investing in a responsive, mobile-friendly website will pay dividends in the long-run. Investing in a responsive, mobile-friendly website will pay dividends in the long-run. By using a responsive design you will no longer have to worry about how your website design adapts to new technology and devices that will inevitably enter the marketplace. You are future-proofing your website. ​Social Media is a great tool to help drive traffic to your website and increase brand awareness. ​We research your keywords and ensure you are using the right ones, in the right places. This will help you attract traffic from major search engines. Social Media is a great tool to help drive traffic to your website and increase brand awareness. With a H22 website, you can easily share rich content on all social media channels. Your website will be linked to your social media channels in such a way that search engines will use social media signals to help rank your website. We research your keywords and ensure you are using the right ones, in the right places. This will help you attract traffic from major search engines. ​We're proud of our digital portfolio and the trust our clients have placed in our online expertise. If you'd like to see more just get in touch!